A strong e-mail list can give small and medium-sized businesses a chance to speak directly to their consumers. The fact that users have voluntarily signed up typically means they are more open to the messages being sent to them. Companies come up with all kinds of online strategies to gather e-mails, including giveaways, contests, and other digital marketing tactics—but it can be just as effective to use offline or “ground” campaigns to entice consumers to sign up for your e-mail list. In an overwhelmingly digital era, it can be difficult to embrace the idea that offline campaigns provide a wider variety of opportunities for marketers to gather e-mail addresses. You can still have giveaways and contests—but think about how much more effective those marketing tactics can be when you are physically present at a location! Let’s say you have a business in the organic food industry. By marketing your business at a booth (as a vendor at a trade fair, for example), you can immediately give away samples of your food rather than solely offer e-coupons or promotions through e-mail. This is a much better tool for promoting customer engagement that isn’t entirely possible through online efforts. In-person marketing can be done at any event. If your company is sponsoring a charity or non-profit initiative, for example, be sure to include floor space for an e-mail sign-up sheet. Stay active in your local community and look for ground opportunities to build your e-mail list. All of these options will go a long way toward establishing your brand. 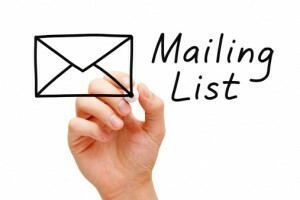 A direct mail marketing campaign is another great way to grow your e-mail list. Direct mail is the most subjective form of marketing and engages your target audiences on a personal level. Try to include some kind of pitch in the mailer form to encourage your customers to sign up for your mailing list—this is a good angle to interact with your target audience and grow your e-mail list. Of course, your business must have some kind of online presence if it wants to remain profitable! Executing offline efforts without somehow incorporating the digital aspect of a campaign will not only minimize the effectiveness of the initiative—it may actually put it in jeopardy. Conducting an offline marketing campaign is twofold as it helps build your e-mail list and combines the offline with the digital. But you can take things a step further and direct people to your web site; ensure they follow you on all of your social media platforms, or maybe include some kind of giveaway that can only be accessed online. Remember, both digital and non-digital resources are needed to build your marketing campaign and your e-mail list. Macromark has been working with clients to execute strategies on how to best communicate with customers on their current e-mail list, as well as direct mail tactics to build on that list. With close to 30 years of direct marketing experience, we know what it takes to help your small business stand out and reach more potential consumers. Contact us today for details on what we can do to help you better reach your target audience.